Statistical model returning Poynting Flux (in W/m^2) energy flux into the ionosphere. The model was compiled using FAST satellite observations that are binned and mapped into the ionosphere altitude range (~ 1210 km) on magnetic coordinates. Solar wind Density (N in cm^-3), velocity V (in km/s), magnetic field By, Bz (in nT), AL index (auroral magnetic perturbation). 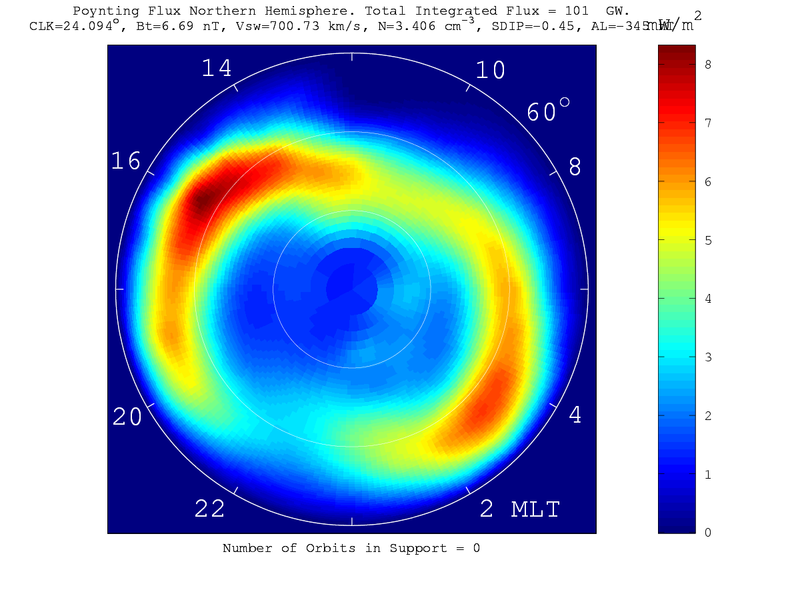 Pattern of Poynting Flux distribution in auroral zone (> 50 degrees magnetic latitude), averaged over both hemispheres.